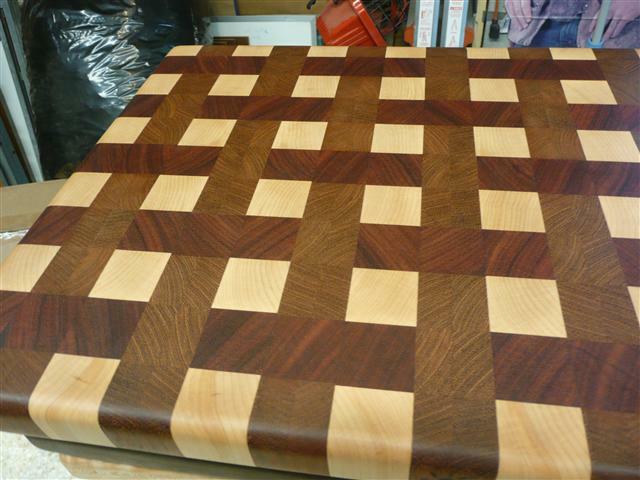 We have made hundreds of cutting boards over the past few years. Most all of our boards are one-of-a-kind designs based upon the wood types, grain patterns and actual pattern layup. There are a few patterns we've repeated, such as the footballs and the American flag designs, but the vast majority of our work has been unique, individual creations. Our boards are made of either all end grain or all face/edge grain pieces. There are no stains or dyes used in the making of our cutting boards. The colors you see are the natural wood colors that are only enhanced by the food safe, mineral oil treatment. All of our cutting boards are glued up with a waterproof type glue and will provide you with generations of use. All of our boards have rubber bumper style "feet" underneath that keep the boards up off your countertops and out of any moisture below. Never place a wooden cutting board in a dishwasher, and only treat the board surfaces with mineral oil or a commercial cutting board / butcher block treatment. - Our Kitchen Pro Series boards have a flat cutting surface. We make these flat cutting boards in a range of thicknesses from 3/4" to 3". - Our Chef Pro Series are sculpted boards that have a slightly sloping, concave surface that provide drainage and totally eliminate the need for juice grooves, and their associated additional maintenance and sanitation concerns. This cutting board innovation was developed by KND several years ago. It is the only sculpted, sloped-to-drain cutting board available anywhere today. It's unique design directs all liquids and juices towards the center and off the end of the board. You can either catch them on your serving platter/plate or let the board overhang your sink for drainage. This innovative design totally eliminates the need for those messy, hard to clean and maintain juice grooves!